The Canvasback had long been one of my “white whale” birds. It used to show up on the Hudson fairly often, and it was one of the birds I expected to get during my big year of 2012. I did not, however, despite two next-day chases of Canvasback observations in January 2012. My unsuccessful search for a Canvasback on the Hudson in Chelsea on December 31, 2012 brought my big year to a close. So it was with great excitement that I saw two messages on my return from the gym at 1 p.m. on January 12, 2014 (the day after I found the Snowy Owl). The first message was a report of three Canvasbacks still being seen at noon at Swindler Cove Park. The second was an eBird report of a Canvasback observed sometime during the morning on the Bronx Kill on the northeast shore of Randall’s Island. Naturally, I planned to chase these birds right away — but which? The Swindler Cove sighting was the more recent, by perhaps as much as three hours, but getting there would take nearly an hour. The Randall’s Island bird was much closer — I could reach it in a half hour by running across the RFK Bridge — and there was an additional attraction: a Common Raven had been seen lingering on Randall’s Island both that day and the day before. If I got the Canvasback, I planned to search for the raven. If I missed the duck, then I would have to put off looking for the raven and go to Swindler Cove. Ravens are becoming regular in Manhattan, but I could not afford to miss the Canvasback. After a fast subway ride and a run across the bridge, I was on the northeast shore of Randall’s Island, searching the canal for the Canvasback. I really wanted it to turn up, so I double-checked the Kill and then looked further out in the bay. I had already done an intense morning workout and did not feel like doing more; it was also starting to get cold. But twenty minutes of searching could not produce the Canvasback, so I ran back across the bridge and then across Harlem to catch the A-train. Just after 3 p.m. I arrived at Swindler Cove Park. It took some scanning, but I found the three drake Canvasbacks exactly where they had been reported previously, on the opposite shore near some wooden moorings. I had waited a long time and searched many miles to add this bird to my life Manhattan list (#235). I went further inside the park, away from the Sherman Creek mud flats to look for other birds (Swindler Cove can offer surprises) and twenty minutes later the Canvasbacks were no longer in view. At least one Canvasback reappeared over several following days at Swindler Cove, and on January 15 two drakes showed up on the Central Park Reservoir but were not publicly reported until after dark. Finally, a Snowy Owl appears in Manhattan. Since this species first began showing up at LaGuardia airport, less than two miles away, in November 2013, I have been waiting for it to appear on Randall’s Island. The environment is perfect: acres of flat grassy fields where gulls, ducks, and geese come to graze, along with a sheltered bay that also attracts hundreds of waterfowl. I would imagine there are rats and mice to be found, too. I visit the northeast shore of Randall’s Island nearly once per week. It has the potential to produce rare ducks and gulls, as I have written before. In recent weeks it has had small flocks of Horned Lark and Snow Buntings, the latter having been observed just two days ago. Today my mind was on the Snow Buntings. I also wanted to do some running, so I ran across the RFK Bridge to Randall’s Island at noon, figuring I would take advantage of what the radar indicated would be a rain-free two hours, along with temperatures in the high fifties. It certainly was not rain-free. Strong winds blowing in off the water carried plenty of tiny water droplets, and soon my binoculars and I were soaked. After seeing that the bay contained only some of the most common ducks, I was thinking this trip was not such a great idea. I went further east along the shore to look for the snow buntings, which were known to huddle on the rocks. Then I saw the Snowy Owl 60 yards ahead on the paved road. It was just landing after what appeared to be a short flight from a bit further east and south. I looked closely for a minute, making sure I confirmed the relevant features: yellow eyes, small bill, owl body, and mostly white feathers with just some tiny dark patches. No question it was a snowy. The next thing I did, at 12:30 p.m., was text Andrew Farnsworth, not just so he could see it, but so that he could get the word out quickly and appropriately. He posted my find to NYSBirds, and then started preparing to drive over. While this was going on, the owl took off and flew. I was worried that it would leave the island, but it only went to the grass just southeast of ball field #29. Ten minutes later it flew again, this time returning close to its initial location. It was looking right at me, so I backed further away until only part of it was in view. I did not want to take any chance of scaring it away. It seemed to be resting quietly, and I was getting cold and wet just standing there, so I ran to the McEnroe Tennis Center to wait for Farnsworth to arrive. He showed up at 1:17, and I ran out to meet him. We walked back to the northeast shore area, and the owl came into view exactly where it had been before, very low and close to the rocks just east of ball field #29. We observed it from seventy yards away, and Farnsworth took some photos (one of which appears above) using his iPhone and binoculars. After ten minutes of watching, we went off to bird the bay and the large waterfowl flock on the other ball fields. This Snowy Owl was my first life bird in nearly three months, and my 234th in Manhattan. 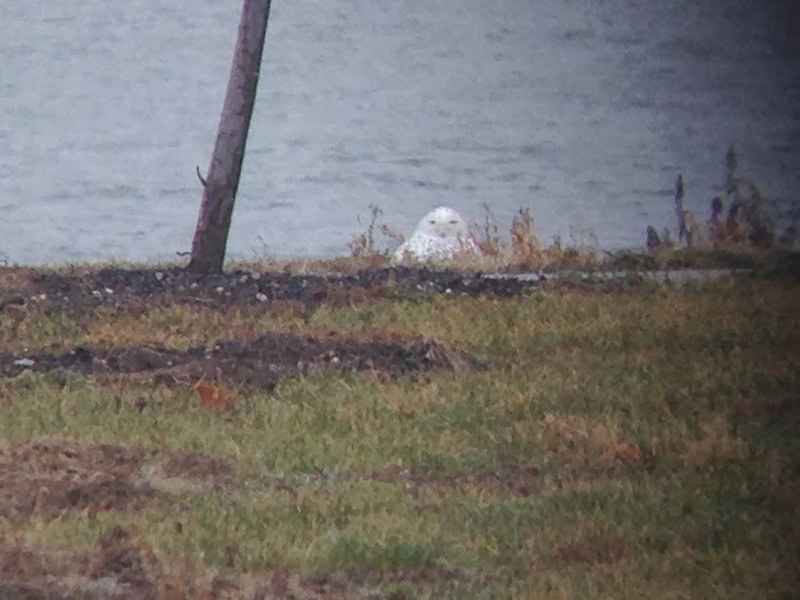 It is also the first confirmed Snowy Owl observation in Manhattan on eBird, and certainly the first one in over a decade — perhaps the first ever. We are going to have to check the records on this one. Even though I devoted only about half the time to birding that I did in 2012, I still had a very active and productive year in 2013. The biggest personal highlight was adding 15 new species to my lifetime Manhattan list, ending with a total of 233. I also had 199 species for the year, not far back of the 212 I had in 2012, a total aided by both an epic finch irruption and a hurricane — neither of which occurred in 2013. And once again no other amateurs (i.e., birders not named Farnsworth) came within 20 birds of my county total for the year. In 2014 I expect to bird a lot less often, and I am not at all going to pursue a year list. I want to get back to my work, which has been managing hedge funds and trading securities. This work requires a daily commitment to preparing and trading during the early morning hours. The other issue is that I have done Manhattan birding about as well as I think I can, and it’s time to move on to new challenges. I will still bird for enjoyment and exercise when I want to, and I definitely will take advantage of opportunities to expand my Manhattan life list. 7) Blue-winged Teal — Though not in general a hard bird to find in the New York area in recent years, it has been very rare for Central Park. The last prior observation before I found a pair on the Lake in April was from 2009. 6) Northern Pintail — This duck has been even rarer, with the last Central Park record in 2007. The one that appeared on the Lake in late October lingered on various park water bodies through early December. 5) Lark Sparrow — A rare vagrant anywhere in the New York City area, one showed up on the Great Hill in October and stayed for at least a couple days. One also was found in the same area in 2011. 4) Black-headed Gull — The first eBird record of this species in Central Park was on 30 January 2013. It was only the third such record for Manhattan. 3) Virginia Rail — A very cooperative one appeared on the banks of the Loch on 10 September and was seen again the following day. The Virginia Rail is rarer than the Sora, one of which remained at Bryant Park in mid-October for roughly a week. 2) Red-necked Phalarope — There was only one prior Manhattan eBird record of this species (during Hurricane Irene) before one was found swimming near the Hudson shore just south of Pier 40 on 18 August. Because of an afternoon commitment, I was unable to chase it earlier in the day when other birders were on it and had to race out for it alone with dusk approaching. A very satisfying twitch. 1) Chuck-will’s-widow — Easily the rarest bird on my list, there had been only one record of it on eBird in all of New York City during the past 17 years. It gave good views to many high up in a tree just north of Tupelo Meadow on 16 May.